I’ve been helping and teaching business owners, sales managers, and salespeople how to set-up a sales system(s) for their businesses for the better part of 10 years. In the last couple of years sales automation, using CRM’s, and marketing automation have become very popular, and businesses are trying to take advantage of them. Salesforce is the obvious choice as a CRM for salesforce automation, and they led the field in building awareness for SaaS tools and using the cloud for business. The truth however, is that salesforce is a complicated beast. It’s true that through add-ons and assorted tools and other SaaS software that integrates with salesforce you can achieve and create amazing sales and marketing processes. However, Salesforce is just the beginning. The next generation of ERP and CRM tools are not just automated, they can be designed to predict behavior, and step a prospect, on a one to one basis, through every question, every emotion, every thought, every benefit necessary to move them to purchase, and beyond. Look at Pega (www.pega.com ) for evidence. Currently, Salesforce offers the ability to customize and automate your sales and marketing processes, but you still have to customize it in order to make it work the way you want it to. Not only does that require an implementation period of up to 9 months, making it work requires a solid sales system for prospecting, following up on leads, closing, onboarding and more. Even though so much is possible using salesforce now, you can achieve most of salesforce’s features using much less expensive, yet still robust SaaS tools. There are many CRM’s on the market currently such as Nimble, Zoho, Base, High-rise, Act, Sugar and a lot more, but all of these must be customized in order to work for you – or be of value to you. What do I mean by customized? Put simply, customization is organizing the functionality and workflow of the CRM to match your sales cycle and sales process. This article will tell you exactly how to do that in Insightly CRM, and give you food for thought on many aspects of your sales process, or sales system. Unfortunately, there’s no way to briefly explain this and give you a solid understanding. Therefore, this article is long, involved, and covers many topics. Each topic covered can’t be covered in depth, because they could fill volumes on their own, but overall this will give you a good understanding of how to set-up a sales system and sell with Insightly CRM. I’ve chosen Insightly because it’s a good CRM, developed by friendly, knowledgeable people, and they have a free version which supports two users and gives you more than enough functionality to build a startup or small business into a profitable, well oiled machine. If you follow the process I lay out in this article, your business will grow and you will have plenty of profits to invest in the paid version of Insightly CRM. Also, while you can theoretically use any CRM with the process I will lay out in this article, some aren’t as customizable as they should be. I have had trouble creating this sales process in Nimble, Pipedrive, and another which isn’t coming to mind. It’s not that it’s not possible in these systems to prospect, it’s that my system either doesn’t work in them, or they are too complicated to use my sales system with. 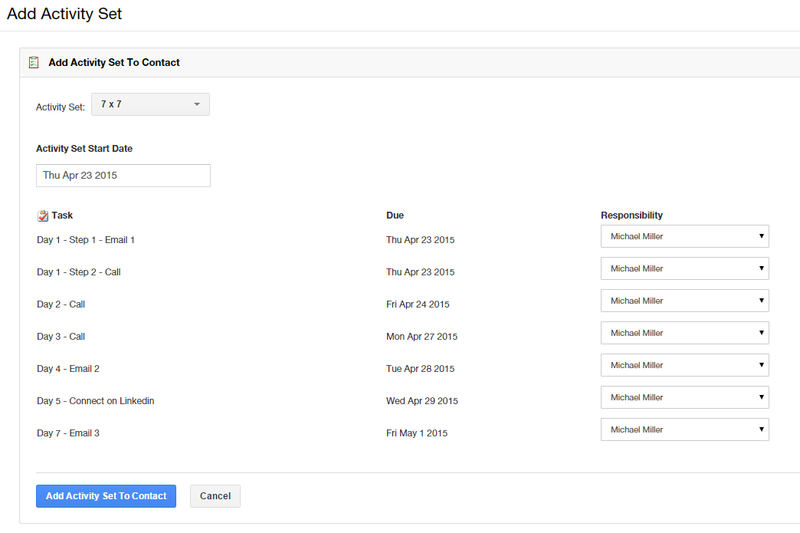 One thing to note: this week (April 14, 2015 as I write this) Insightly launched a lead management feature. Their lead management feature is not available in the free version, but you don’t need it when you use the system I detail in this article. I haven’t tested the new lead management feature yet, but I expect that this system would work well with it, because when you understand the sales system you will be able to customize your CRM to it fairly easily – as long as the CRM has the ability to let you customize it – which Insightly does. Therefore, we will start with the sales system. Before we get into the particulars of building your sales system in Insightly CRM, let’s discuss the sales system in general and the pieces required to convert prospects to leads, and leads to customers. This is important to understand because the CRM doesn’t do the work for you, instead, it helps you organize track, and measure your work. Every sales system follows the customer buying cycle. 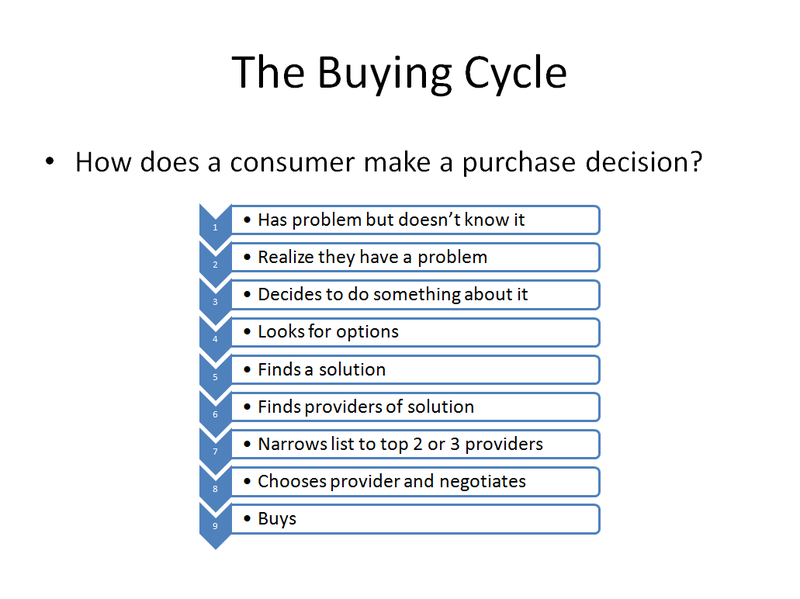 You can represent this buying cycle in many different ways. The most common is AIDA, which stands for attention, interest, desire, and action. An alternate buying cycle model that is commonly used is ACECA, which stands for awareness, consideration, evaluation, customer, advocate/loyalty. However, it doesn’t matter if you have a four step buying cycle, or a 17 step buying cycle identified – the purpose is the same. A buying cycle represents the decision-making process of a target consumer as they move from suspect, to prospect, to lead, to customer, and finally, if you want to go all out, to an evangelist. Since the stages of the buying cycle represent the current thoughts, needs, wants and desires of the prospect at a specific point in time, content can be developed for each stage specifically that is designed to move the prospect to becoming a lead and then to becoming a customer. I like straightforward explanations, so the buying cycle I have developed is below. It makes sense to me because as a student of human nature, I have seen this play out hundreds of times. The most important thing to remember with the buying cycle is that this represents a funnel in and of itself. The reason is, many people have a problem, but very few realize they have one, or resolve to do anything about it. This drop off in each stage creates a funnel because less and less people make it to the next stage. Also, and this is important, in step 5 a consumer will look for options or solutions to their problem; in step 6 they will choose a solution. Here’s the kicker: the solution they find, might not actually be a solution at all. Actually, in most cases, it’s an easy option with limited risk and will not actually solve their problem. This is human nature at work, and marketers and salespeople can take advantage of this propensity if they wish. I’ve created a video to explain this in detail. View “What is a Sales System” here. Many people think the customer buying cycle exists on its own as a separate entity from the sales funnel, when in actuality the sales funnel is built upon the customer buying cycle. This is why every sales funnel looks similar. However, it’s a mistake to blindly adopt a generic sales funnel. Before you can fully develop your businesses sales funnel you have to understand your customer buying cycle. Think about these scenarios: buying car insurance, buying health insurance, buying life insurance. All of these products are insurance, yet the buying cycle varies greatly. That means, if you’re selling one or more of these different forms of insurance, you will need to match the way you sell to the way your customer buys. Just remember, the buying cycle and the sales funnel is not a chicken and egg scenario. The buying cycle always comes first. The sales funnel is developed to match the buying cycle. As I said above, each stage of the buying cycle represents the current thoughts, needs, wants and desires of the prospect at a specific point in time. The goal when creating a sales funnel is to develop content and messaging that influences the decisions of the prospect in order to move them through their buying cycle and become a customer. In your business you may have many different buying cycles depending upon the products and services that you sell. You may think that you need to develop specific systems and sales funnels to handle each buying cycle, yet it actuality you don’t. The more generic your sales funnel is, the easier it is to adapt to individual buying cycles. The best option is to use a sales funnel that is generic, yet robust enough to cover the various types of scenarios your business encounters. Each stage of your sales funnel has the ability to become a subsystem. The most common are marketing, prospecting, presentation and proposal follow-up, onboarding, customer follow-up and retention, and customer reactivation. Each of these subsystems can get quite complicated. Therefore, in this article I’m just focusing on the prospecting subsystem because it’s the easiest to understand, it’s the most needed, and once you understand it, it will be easy to apply the knowledge you gain to the other subsystems yourself. The first thing you need to understand about prospecting is it requires anywhere from 5 to 30 “touches” before you will get hold of the contact in order to have a conversation. That means, you will have to organize your work so that you can reach out to a specific person over and over again. The more work you have to do to get in touch with a prospect, the less prospects you can work in a single day. It may require five calls to have a conversation, and depending upon the persuasiveness of your argument and the prospect’s need for your product it can require one or more conversations to get an appointment. When you add the necessity to give presentations and perform customer service activities, you can see how difficult the salespersons job can become. This is why the salesperson must manage their time effectively. Some companies have split these prospecting, presentation, and customer service activities up into different job functions. Doing so allows the sales people in each role to perfect and streamline their job function. But this requires a large company with plenty of capital and personnel resources. For a small business, the prospecting, presenting, follow up, and customer service tasks must be done by each individual sales person. That’s why you need a CRM that has been customized to your businesses individual sales funnel/sales process/sales pipeline. If I go into a business that does not have a CRM in place and see that their sales reps are not overwhelmed, it’s a red flag. It tells me that either they are only placing one call into a new prospect, or their activity levels are low and they are probably not prospecting on a consistent basis. If you are actively, consistently reaching out to 10 – 15 new prospects every day, and calling each consecutive day until you get hold of them, at some point within the first week you will reach a level of prospecting activity that simply cannot be accomplished in an eight hour day with a manual process. 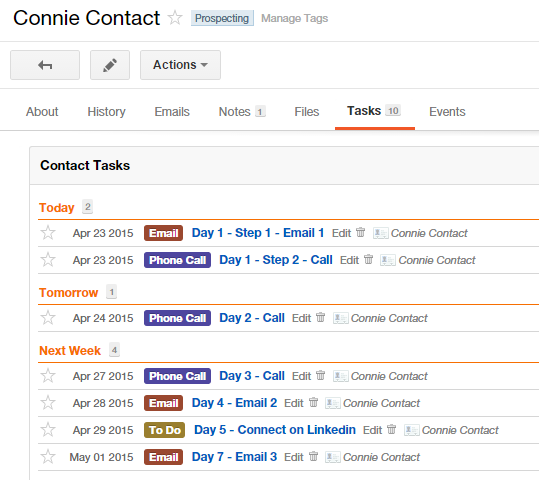 A CRM gives you the ability to organize your tasks in such a way that you can easily complete them. You see, even veteran salespeople are prone to wasting precious selling time trying to figure out what to do next. A CRM tells you what’s on your plate for the day, what tasks you have, and helps you keep track of what you have to do, to move the prospect towards a close in the future. So, enough talking about a prospecting process and telling you the benefits of it, let me show you what a prospecting process contains. Just keep in mind that each day, as a salesperson, you have multiple responsibilities. Those responsibilities include prospecting, presentations, follow-up, and customer service activities. Your constraint is time. Since you should prospect every day, you will have to build your prospecting process to match the time you have available. For instance, if you only have two hours available for prospecting each day, you may only be able to add five new prospects each day because you will be following up with the prospects you have not had a conversation with yet from previous days. As I said above, it will take several attempts to contact a prospect before you will have a conversation. Therefore, you will have to call, email, or send them direct mail over a specific timeframe (e.g. 7 business days). I can use any timeframe I want, but let’s use seven business days for example. On each day, I can perform any number of different activities. Typically, these activities are a call, an email, and direct mail. The process I set up will depend upon the type of contact information I have for the prospect. If I have their email address, I can send them an email. However, if I only have their phone number, then that limits the ways I can reach out, obviously. 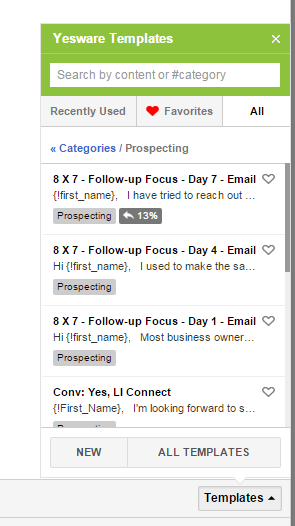 A common example of a prospecting process is the 7 x 7. The 7 x 7 stands for seven touches over seven business days with the ultimate aim of having a conversation. Once you have a conversation, then a different subsystem, a follow up or presentation process, kicks in. Day One: send prospect 1st email in the morning; and call the prospect in the afternoon and leave a voice mail if possible. Day Three: call the prospect in the morning, don’t leave a voicemail; and call the prospect in the afternoon and leave a voicemail if possible. Day Four: send prospect 2nd email in the morning. Day Seven: send prospect 3rd email in the morning. 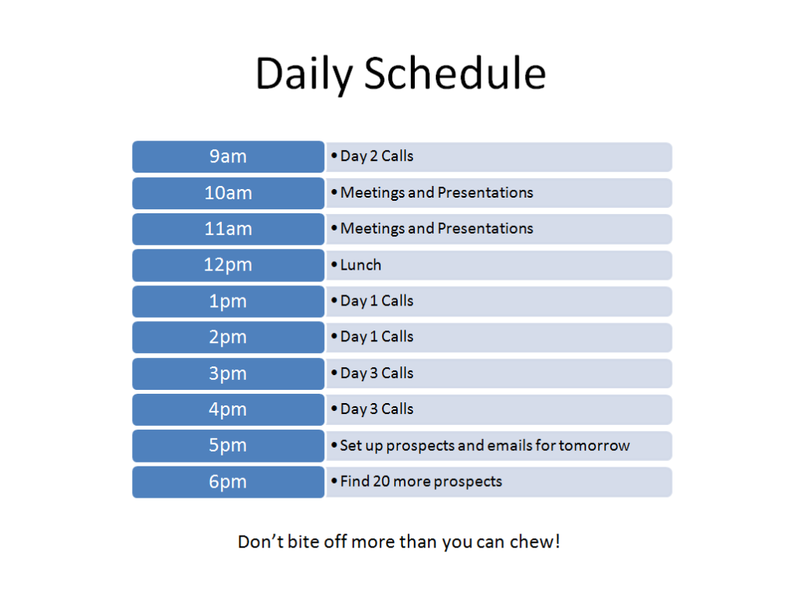 I have refined this 7 x 7 process by removing the first call on day three and asking prospects to connect with me on LinkedIn on day five. As far as sales and marketing collateral goes, you will obviously need a sales script for having a conversation with the prospect, and you will also need three emails. The emails are designed to get the attention of the prospect and prepare them for your call. To use an old naval term, I think of it as a shot across the bow letting them know that I have my sights set on them. The first email introduces you and your offering and asks if they are the right contacts. If they are not the right contact, it asks if they will refer you to them. The second email is pain/benefit focused. It essentially says, if you’re having X pain, you could enjoy Y benefits with our product or service. The third email is an attention grabber. If they haven’t responded to any email or voicemail, you are going to have to do something to get their attention. Usually this requires an unusual subject line and an unusual image. Now that you have an understanding of the sales system – that the sales funnel is built off the buying cycle and each stage in the sales funnel has distinct subsystems which contain their own processes – and you have mapped out and documented your sales system, it’s time to set up the Insightly CRM. 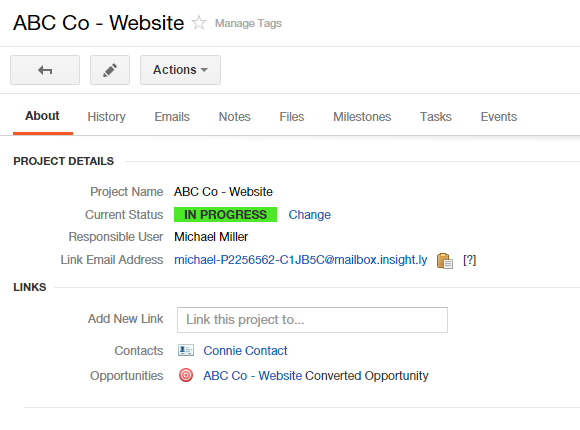 Insightly’s free version gives you the following sections/areas: tasks, contacts, organizations, opportunities, and projects. You can think of them as groupings of information, but they can also be used to organize your sales system/sales funnel. For instance, my sales funnel has the following stages: prospecting, initial contact made, sales readiness qualification, needs discovery/education, presentation, proposal delivered and negotiation, best few, and won. I have developed this funnel over time from information I obtained from Miller Heiman and Sandler Sales Systems. It works well for selling consulting and services in the B2B space. Insightly doesn’t have any sales funnels available out-of-the-box. It’s designed to be customized. What I’m about to say will become clear as you read on, but I use activity sets on contact records which create tasks for my prospecting subprocess, I use a customized pipeline in the Insightly opportunities tab for leads, and I convert won opportunities into projects. This covers every stage of my sales system/sales funnel and keeps me on top of all of my prospects, leads, and customers. Therefore, to be clear, my sales system/sales funnel spans Insightly’s tasks, opportunities, and projects. While it might seem quite complicated at first while reading this, in actuality, it’s quite easy and straightforward. Watch the video, “How to Customize Insightly for Prospecting” to learn more and get a thorough understanding of this process. I accomplish my prospecting activity using what Insightly calls, “activity sets.” Activity sets are simply preplanned sequences of tasks that are instantiated, or created, all at once. Essentially, they are processes that can be created that will. Now, where might we be able to use these activity sets? Remember, each step along our sales funnel path gives us the opportunity to run a subsystem, or sub process (I mentioned this above under Prospecting Subsystems). For the prospecting subsystem, we need to create the prospecting process. This is the 7 x 7 process (or whatever process you create) that we will utilize for prospecting. 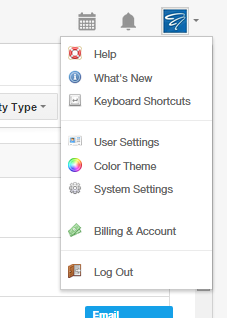 To set up Activity Sets in Insightly, simply go to the icon in the top right to access your settings and account. To add an activity set, in the blank field that says “Activity Set Name,” type your name and check the box under “For Contacts.” Finally, click add. You will add new activities by clicking the “Choose Activity Type” drop-down box. Typically, you will be selecting “task,” but the ability to add an event becomes powerful in other subsystems. When you choose task, it opens the task detail panel. You can add any details you want to help you remember what this task does. For category, choose the task type. For instance, my 7 x 7 is made up of emails, phone calls, and to dos. 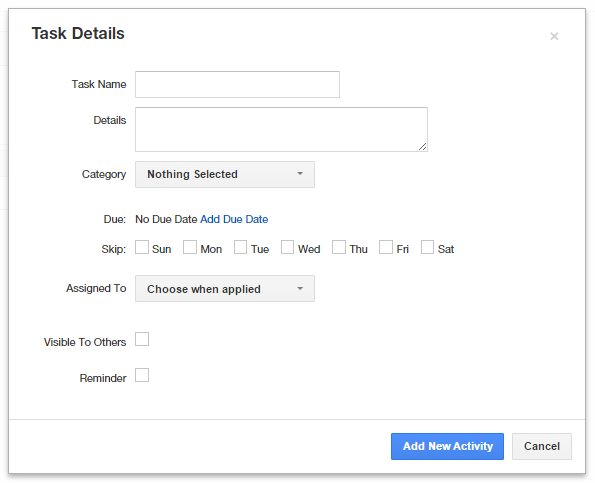 For “Due,” click the “Add Due Date” link to expand the due area. Day one starts at zero (0). Therefore, the tasks for day one are inserted as “0.” That makes this section read, “Due 0 days after activity set start date.” Whatever day you are adding a task for, just subtract one. If you click the “After Activity Set Start Date” drop-down, you will get an option for “Before Activity Set End Date.” I never use it. For “Skip,” since we are only talking about working this subsystem on business days, we will choose, or skip, Sunday and Saturday. For the remaining options, I simply check “Visible to Others” as I have in the image below. “Save” it and Continue adding each day’s task until you have completed the prospecting subsystem. You can see below the steps I have in my 7 x 7 activity set (which can also be called the prospecting subsystem). Note: the emails in the image below have 8 x 7 in the name, but that’s a remnant from tests I’ve run. You can name it anything you want. 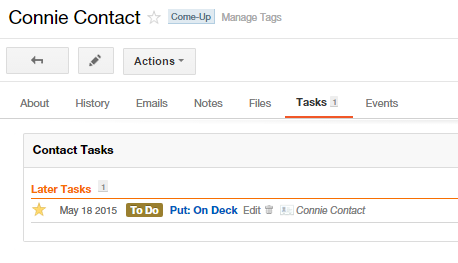 When you add an activity set to a contact, these tasks are instantly created and assigned to that contact. I’ll show you how to do this later. Now that you have built your prospecting subsystem activity set, it’s time to build out the rest of your sales funnel. To see how I do it, watch the video, “How to Customize Insightly for Prospecting” to learn more and get a thorough understanding of this process. Pipelines can be made to represent the sales funnel. In other words, designate the stages of the sales funnel – the steps along the path to close. Insightly works by assigning statuses (which represent stages in the sales funnel) to a contact. The neat thing about Insightly is that you can create multiple pipelines to be used with contacts, with opportunities, and with projects. We won’t get into all that in this article, just know that the potential is there and it gives you a lot of room to customize Insightly to your business processes. 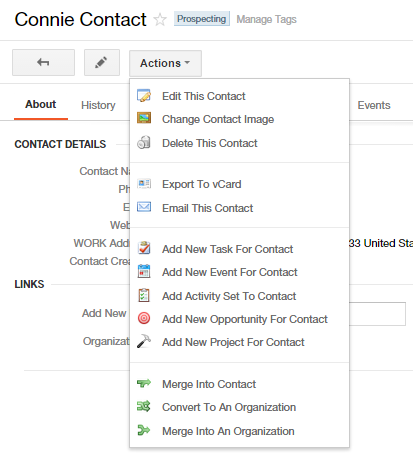 To set up your sales funnel/sales pipeline, simply go to the icon in the top right to access your settings and account. 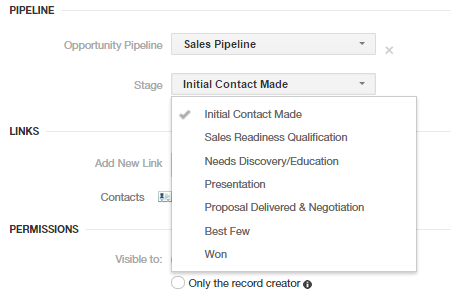 Similar to creating an activity set, creating a pipeline is as simple as typing in the name, choosing the category it is for and clicking “add pipeline.” As you can see in the image below, the sales pipeline exists in the opportunities category. Once you have created a pipeline, click the “Edit Stages” link. This brings you to the pipeline stages panel. Here is where everything I have said before about your sales system comes into play. Since we are building the sales funnel/sales pipeline the stage names are represented by the stages of your sales funnel, obviously. Remember when I said, “In each stage of your sales funnel you have the opportunity to run a subsystem?” Here is where you can do that. Each stage gives you the ability to instantiate, or start, an activity set automatically when a contact enters that stage. Don’t think, however, that you have to have an activity set for each stage. For instance, I don’t have any activity sets in my sales pipeline stages, although I could create one for when a deal is won and a lead becomes a customer. That said, I’m sure over time you might find good reasons to run activity set/subsystems in each stage of your sales funnel/sales pipeline. As you create a stage, Insightly lines up and illustrates the stages for you – as you can see below. 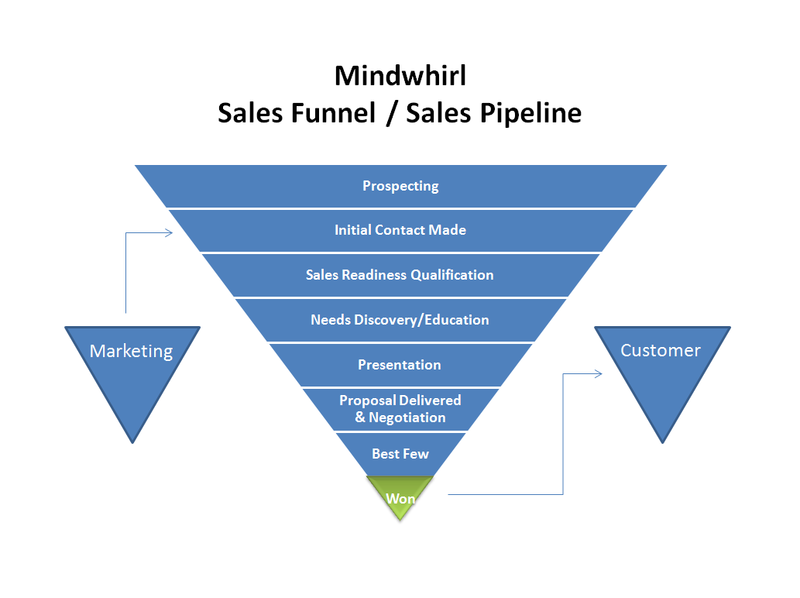 Here are Mindwhirl’s sales pipeline stages. Be aware that the first stage of our sales funnel/sales pipeline is prospecting, the second stage is initial contact made, the third stage is sales readiness qualification, and so on. 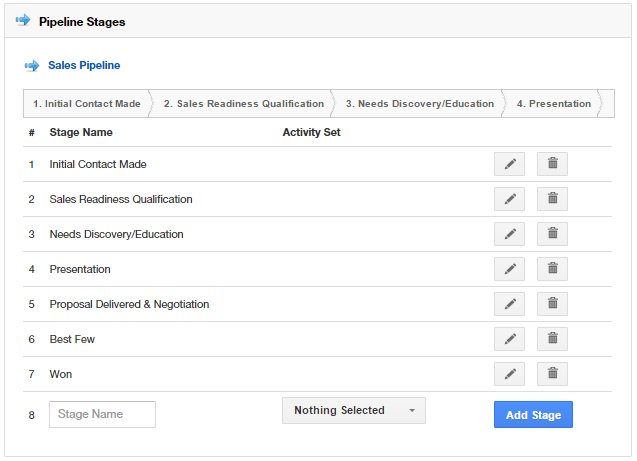 This pipeline starts at stage 2 because we are using an activity set applied to a contact and a status tag to prospect. Then, we are using a pipeline associated with an opportunity to move that contact toward the close, which is a project. 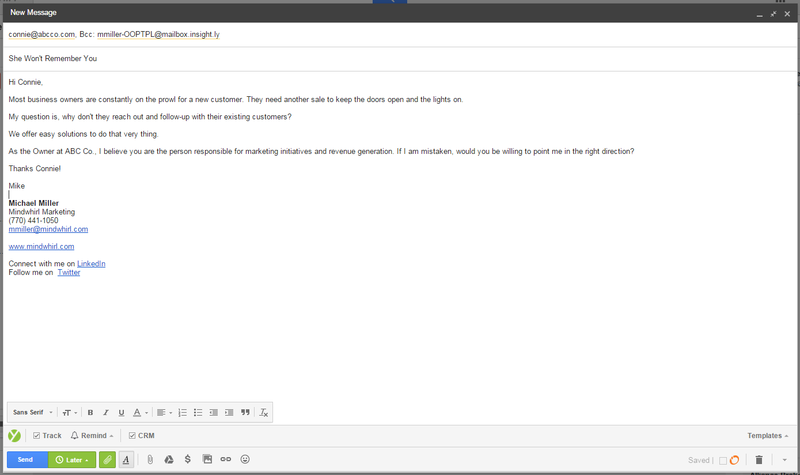 I mentioned that Insightly has a new “Leads” category for paying customers. 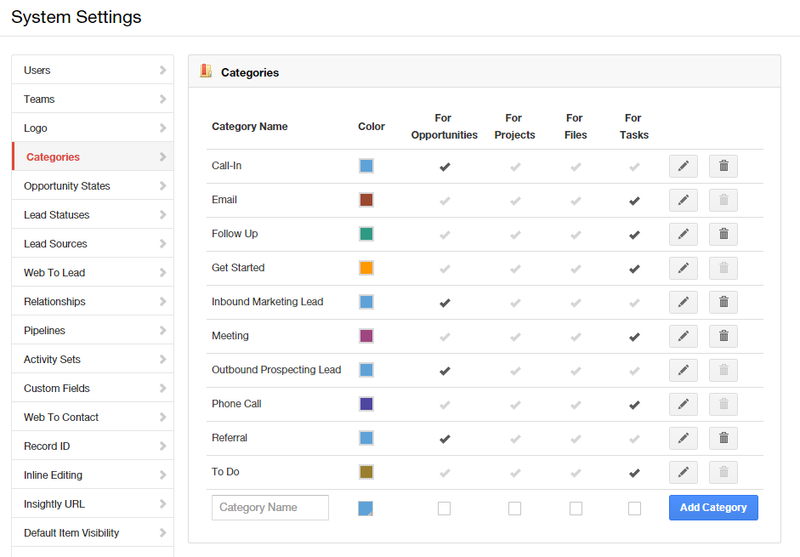 Even if you are making use of this new feature, you will still have to flag the contacts you are currently prospecting the way I will describe using activity sets in the next section. 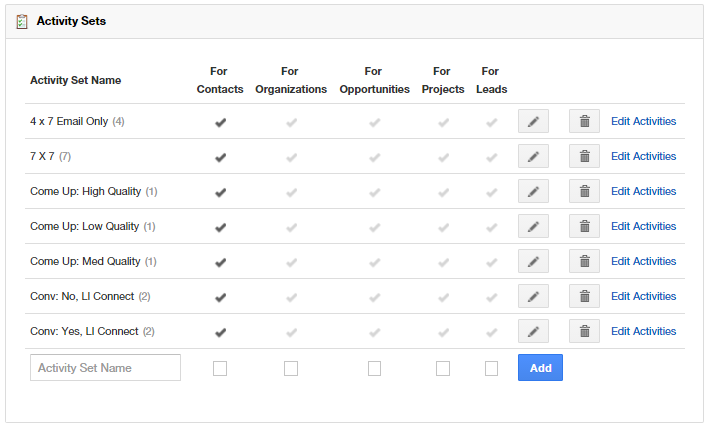 The new “Leads” feature seemingly can be used to create the different stages of your sales funnel/sales pipeline. However, I only use opportunities for that function. 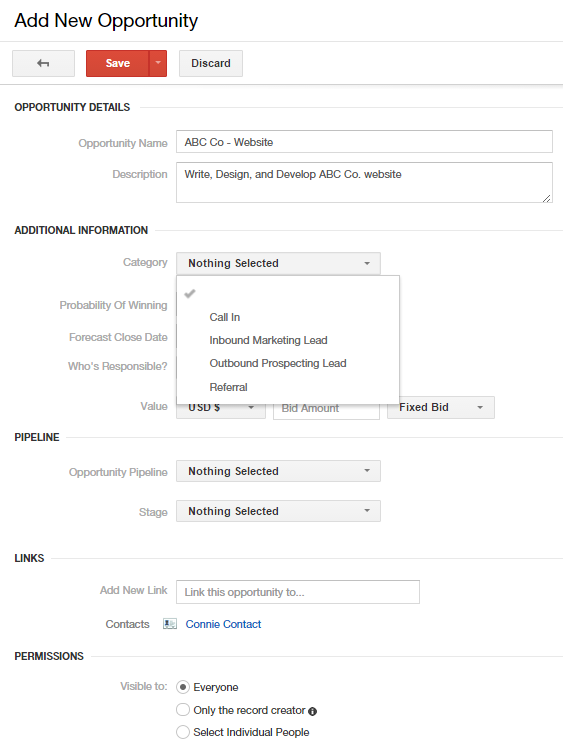 If you use both the “Leads” and “Opportunities” categories in Insightly, you will have to split up your sales funnel/sales pipeline and assign only a couple of the stages above to each category. Using my sales funnel for instance, you could use a sales pipeline for Leads that contained: stage 2 – initial contact made, stage 3 – sales readiness qualification, stage 4 – needs discovery/education, and stage 5 – presentation. Then you would have to create a sales pipeline for Opportunities that contained: stage 6 – proposal delivered and negotiation, stage 7 – best few, and stage 8 –Won. Note: once an opportunity closes and moves to the “Won” stage, it is converted to a project. Once you have your stages set up in your sales pipeline, you are ready to move to the next step. To recap, every day you add a predetermined number of contacts into your sales funnel/sales pipeline. When they are imported they are typically contacts which have no status. Therefore, we need to assign a status to each contact that we are prospecting. In fact, there are several statuses that can be applied to contacts as they move through our sales funnel. 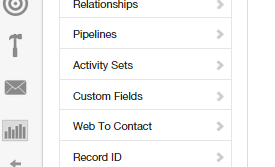 In Insightly, the only way to assign statuses to contacts is through the use of tags. If you’re not familiar with tags yet, you are missing out. Tags are extremely useful for helping you filter data and information. For instance, in this case we will be using tags to assign a status to a contact, and we will use the tag to filter the contact database and show us only those contacts which are assigned a specific tag, or status. Note: you can find these tags on the right side of the contacts area. Ancillary-Contacts – contacts in the company that I have determined are not decision-makers but may be useful in the sales context. Client – this contact is a client. Dead – I have spoken to this contact and have determined them to be unqualified in one of several ways. Either they’re too small, they are too large, they have no money, they will never be interested, or I don’t want to work with them. Lead – I have spoken with this contact and they want to discuss their issues, see if I can help them, and take advantage of my services, but have not yet signed the paperwork. Missing-Contact-Info – this is an additional tag, which helps me realize that I will not be able to contact them in some way. 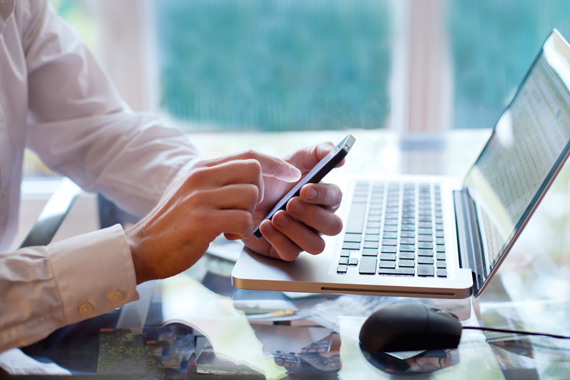 Prospecting – this contact is currently in the prospecting process. Review – I’m currently reviewing this contact for some reason. Typically, I tag a contact with the review tag when I haven’t been able to contact them and I’m unsure if they are actually a good target. I come back to review contacts regularly. Waiting-to-be-Prospected – these are freshly imported prospects. I add 20 new prospects to my sales funnel each day. I could import 20 each day, but I prefer to import 400 new prospects each month. 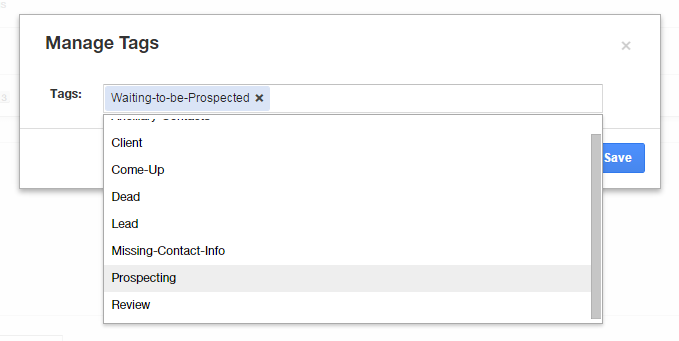 When I set up the .CSV file to import new prospects, I add the tag “Waiting-to-be-Prospected” to every record so that the contact is imported with the tag automatically. Then, each day, I merely click the “Waiting-to-be-Prospected” tag filter, which re-sorts the list, and I select a contact. 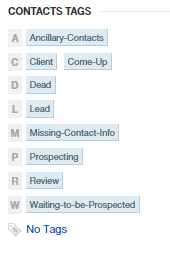 I then click on “Manage Tags,” at the top of the contact record, delete the “Waiting-to-be-Prospected” tag, and add the “Prospecting” tag. I do this in a round-trip fashion 20 times as I set up the Day 1 emails to send (I’ll demonstrate this again later). The thing to remember about tags in Insightly is they are only created through this dialog box and they only exist if they are assigned to a contact. If the last contact with a specific tag is re-tagged, that tag is deleted and will not show up in the list above. I use that function to my benefit by not importing any new contacts with the “Waiting-to-be-Prospected” tag until all the previous contacts under that tag are gone – and the tag along with them. When I import the 400 new contacts each month, each record is tagged with the “Waiting-to-be-Prospected” tag, so it comes back. Opportunity states are not mission-critical, but are very helpful for reporting. They help you understand which stage the prospect was in when they decided to purchase, or not purchase. They also help you understand where you are losing prospects with your message. You will find that those prospects speak with you, but go dark at some point in the sales funnel. It’s important to track what stage they are in when they go dark. It will help you improve your message at those stages. There are five predetermined opportunity states within Insightly: open, won, abandoned, suspended, and lost. 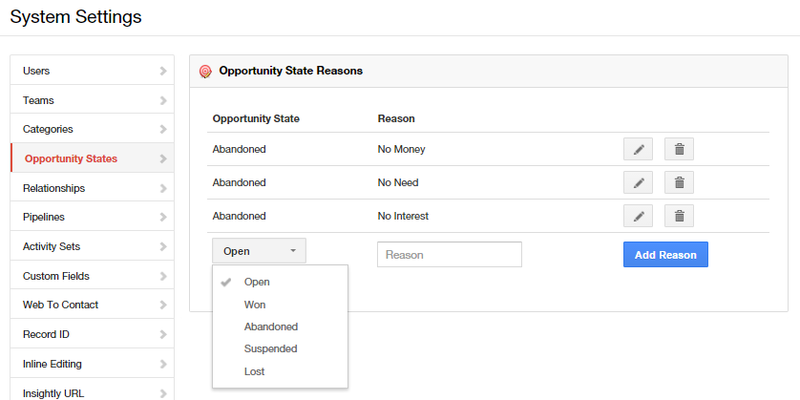 Under the system settings, you can assign reasons to each of these opportunity states. As you collect data, these reasons will become invaluable because you can write scripts to overcome these objections, and identify them early on in the sales process. To see how I do it, watch the video, “How to Customize Insightly CRM for Prospecting” to learn more and get a thorough understanding of this process. Categories help you track where a prospect came from when it is converted to an opportunity. I use four categories for opportunities: call in, inbound marketing lead, outbound prospecting lead, and referral. You set categories under System Settings > Categories. Similar to the other sections, to add a category you simply enter the name, check the box in the appropriate column (in this case for opportunities), and click add category. Now that you’ve customized Insightly, you’re ready to start selling. If you have any more questions regarding setting up Insightly to match your sales system, I’ve created a video which shows how to set up these different pieces of a sales system in Insightly. 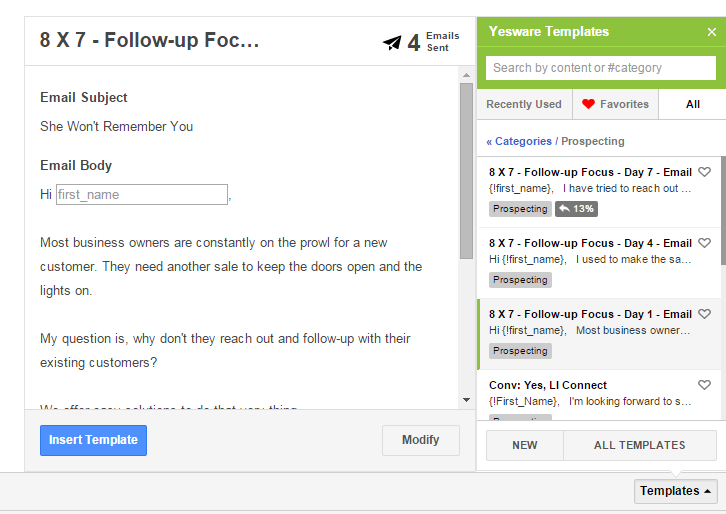 You can view the video “How to Customize Insightly CRM for Prospecting” here. Now it’s time to put everything we’ve learned together and start selling with Insightly. While there are many stages in our sales funnel, I’m going to discuss the prospecting process mostly because regardless of the stage you are in, the process is essentially the same. Let’s quickly recap the sales process in Insightly. 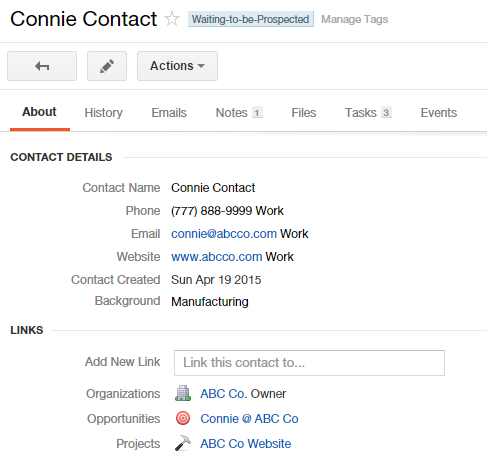 We use tasks associated with contacts for prospecting. Once we get in touch with a contact and they show interest, we create a new opportunity associated to this contact. Then, once we close the deal we convert the opportunity to a project. We keep track of the state of the contact with tags, and we keep track of the state of the opportunity with a pipeline. While this might sound a little complicated, it’s really not. Once you do it once or twice, you’ll be an expert at it. The prospecting process consists of changing the state/status of a certain number of new contacts you want to prospect today from “Waiting-to-be-Prospected” to “Prospecting,” and assigning the prospecting activity set to the contact (e.g. 7 x 7). From there, all you have to focus on is completing the tasks that have been created. As you add new contacts to prospect every day, you are simultaneously creating tasks over the next seven business days. Each day you must perform the tasks for each contact within your prospecting subprocess. That means, if you add 20 contacts per day and you are using the 7 x 7 process I described above and in the video, each day you will make approximately 60 calls, send approximately 60 emails, and connect with approximately 30 people on LinkedIn. This is why, as I said in the video, time management is essential and you should not bite off more than you can chew. Now let’s talk about the actual process for prospecting in Insightly. Let’s discuss each of these steps. For more information and view a demonstration, watch the “How to Prospect Using Insightly” video now. Before you can begin the prospecting process you need to import prospects into Insightly. I have created a .CSV spreadsheet that I use as a template. This spreadsheet has all of the data columns I need. I have made that template available for you, and you can download it here. 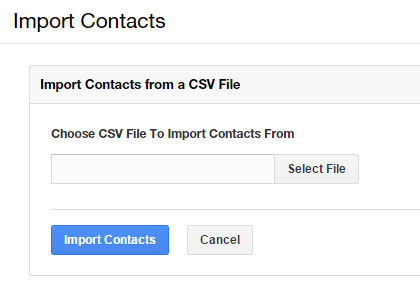 Note: if you need to import more information, simply create a contact in Insightly then export all your contacts and look at the .CSV Insightly created for you. You can use that as a template for importing your prospects with specific additional information you need. Also, if you add a custom field, you will want to do this (export your contacts) to ensure you have the right column name for important. Background – I use this field for industry, although it could also be notes. ContactTag1 – This is always populated with “Waiting-to-be-Prospected” because I add 400 at a time. Even though I have columns named BusinessStreet, BusinessCity, BusinessState, BusinessPostalCode, and BusinessCountry – I don’t typically use them. It depends on where I get my data from. If I pull a record from infoUSA, for instance, it will have this information. However, if I am researching prospects on LinkedIn, I can generally get the email address, website and phone number easily – and that’s all I really need for prospecting since I don’t typically send direct mail. If a contact turns out to be qualified and interested, then I will insert the mailing address info manually. 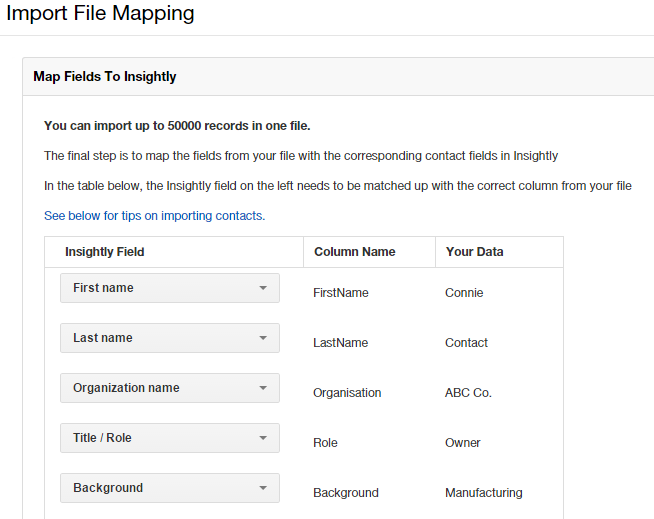 Insightly now asks you to map the fields in the .CSV file to Insightly. If you have created your .CSV file from the template I’ve provided, or from a .CSV that you have exported from an Insightly, your column names will match and there won’t be any mapping work needed to be done. If you’re using the template I’ve provided, you will want to keep the “skip the first row when importing” checkbox checked. 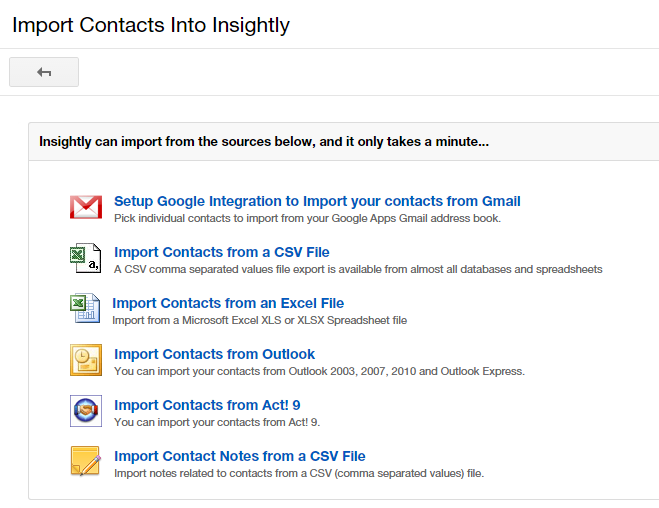 Insightly will give you a message that it is importing those records and will send you an email when it’s complete. If you are importing a small number of contact records, you can typically refresh the browser and see the changes within a couple seconds. 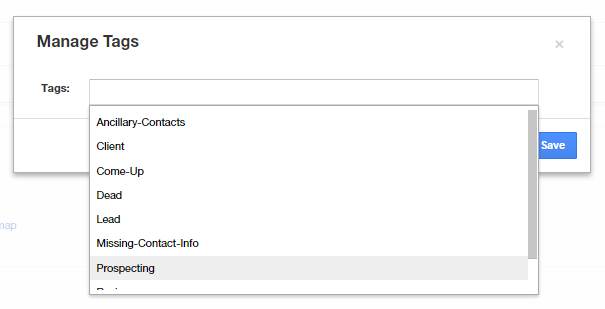 As I’ve said before, in Insightly you can use tags to set the status of a contact. Now, I’ve seen how others set up their Insightly app, and they don’t do it this way. They may use tags to categorize contacts by products or services purchased, or how many times they’ve reached out to them, or their industry, etc. You can do that and add that “functionality” if you want later, however I find that less is more. At first, stick to the way I do it. Add complexity only when it’s absolutely necessary. The way I’ve set up the CSV file, every contact record is already tagged with “Waiting-to-be-Prospected” once I import it. Now, simply type in the tag you want, or if it already exists, choose it from the list. Finally, remove the “Waiting-to-be-Prospected” tag by clicking the X button beside it. Now, you can see the contact record tag has changed and it represents the new status. Now that you’ve set the contact state to “Prospecting,” you are ready to add the prospecting activity set to the contact. 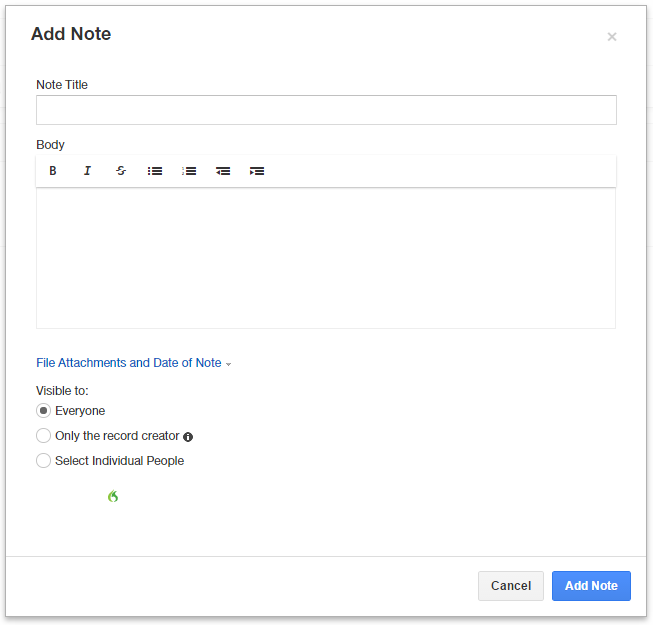 A quick word about activity sets: high-end CRM’s have automation features that will automatically create the next task for you once you have completed a task. 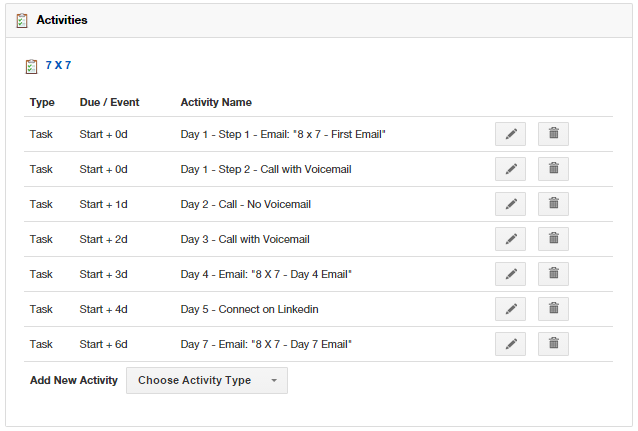 You can duplicate this functionality in Insightly using activity sets. 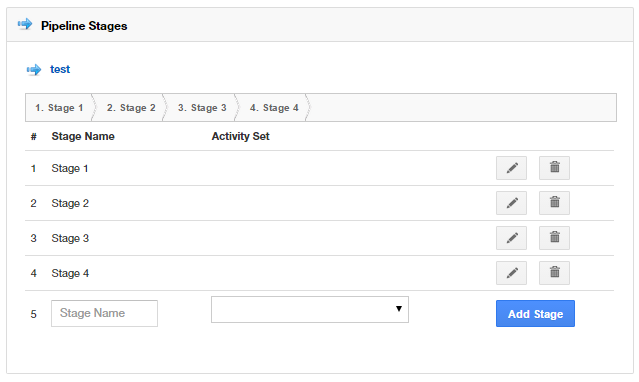 These activity sets will create all the tasks for a certain sub process at once. While this sometimes requires a little manual maintenance to remove tasks that don’t need to be completed, it’s an excellent feature that simulates the abilities of high-end CRM’s without the cost. Using activity sets, you can create amazing processes for all aspects of your business. 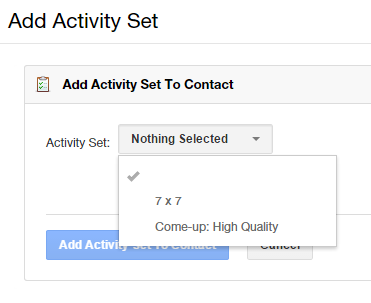 Choose the prospecting activity set you want to apply, in this case the 7 x 7. 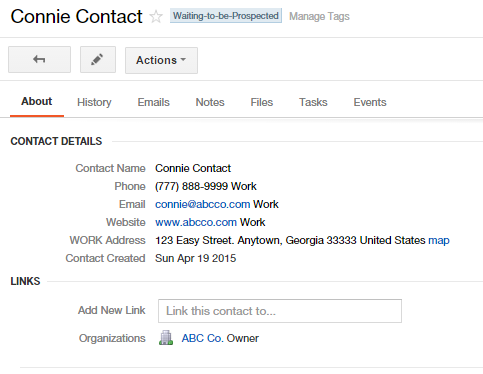 And click “Add Activity Set To Contact” to create all the tasks associated with your prospecting subprocess in that contact record. Notice that the due dates will all be dynamically populated based upon the “Days after activity set start date” information you put in the activity set when you configured Insightly. Now, all of the tasks are created and ready to be worked. 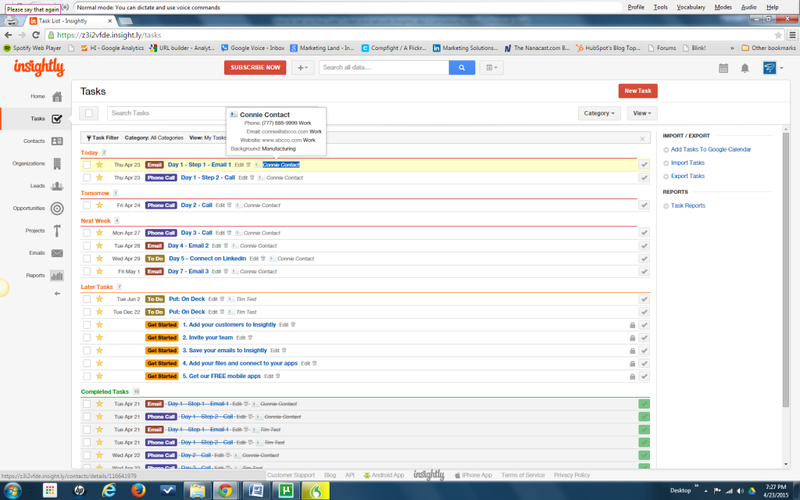 You can see all of your tasks by clicking the “Tasks” tab in the left-hand side navigation in Insightly. 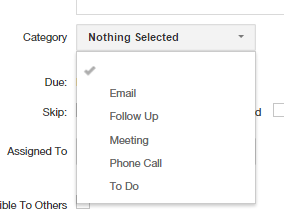 In order to work the daily task list in Insightly you will be doing a combination of sending emails, making calls and taking notes, and changing contact status tags. Eventually, you will need to convert a contact to an opportunity and an opportunity to a project, but we will talk about those in the next sections. Insightly uses your email client to send the emails. You can send these emails one at a time each day while you are prospecting, or you can set them up ahead of time using Yesware (www.yesware.com). To send emails to a specific contact in Insightly, simply go to the contact record and click the email link. Since I use Gmail as my email client, clicking the email link launches my Gmail compose window. You can see that the email “To” field is already populated by Insightly. Also, I set up Yesware to automatically populate The Bcc field with an Insightly mailbox so I can track the emails in Insightly. Yesware gives me the ability to track the emails I send, gives me templates, and even allows me to mail merge all my prospects at once so I save time (although I have to set up a .CSV file first). If I click on templates at the bottom right, Yesware opens a template selection panel. When I choose prospecting, I get a list of the templates in that section. In this case, I’ll choose 8 x 7 – follow up focus – day 1 email. Note: the name 8 x 7 is a remnant from a previous processing process test. The email is still valid though. Once I click the email template I want, a panel slides out that allows me to fill in the personalization fields in the template. 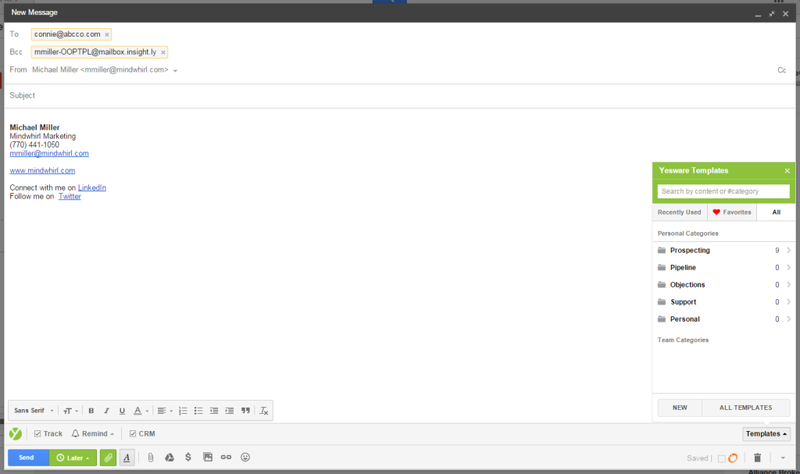 Once I’ve personalize the message, I click insert template and it inserts it into the email. Yesware allows me to set up the emails that need to be sent tomorrow the day before. I’ve found doing that helps me maintain my schedule because I can’t always predict how long presentations will take or other emergencies throughout the day. To set up an email to send later, simply click the “Later” button, choose a time and date and click confirm. 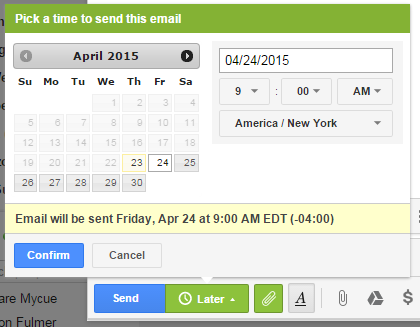 Yesware now gives me a green button to confirm the send on a specific date at a specific time. As you work through your tasks and complete the calls on your list, you will want to take notes on whether you got hold of them or not, and if you did connect with them, what you spoke about. That takes you to the contact record. Now, click on the notes tab (link). Now, simply fill out the fields. If I’m making a call, I put “Call” in the note title. Then, make any notes about the call in the body field. Remember to add names of secretaries or gatekeepers, what you have to press to get to an operator, and any other information you find out like extensions. A lot of salespeople take sloppy notes. That is counter-productive. If this is a blind call into the company, make sure you take meticulous notes about everything you learn. You will need it later. Remember, sales is about thinking long-term. You will thank yourself for clear notes later. 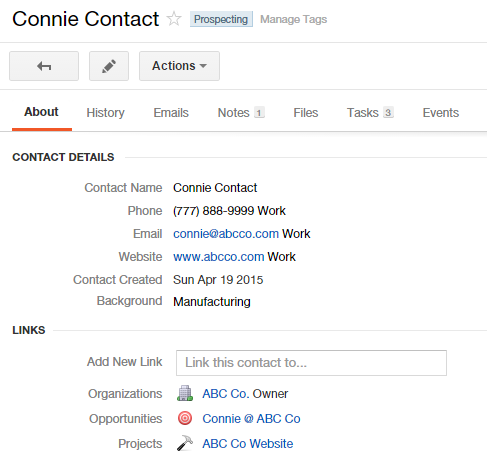 We already discussed how to change contact status tags in the section “Insightly tags: choosing contacts to prospect and setting their status to “prospecting”” above. However, as you prospect you will want to change the status of the contact from “Prospecting” to one of several different status tags. It should be obvious by now what each of these tags are for, however, if you have questions feel free to reach out to me Mike Miller at mmiller@mindwhirl.com. Then, on the “Add New Opportunity” page, simply fill out the fields and click save. As you are filling out the form, there are three drop-down boxes to be aware of: Category, Opportunity Pipeline, and Stage. These are dynamically populated with the information we customized Insightly with in Part 2 of this article. Below you see the opportunities categories we created. Choose the one that matches where the lead originated from. Under pipeline, you choose the opportunity pipeline you created (named Sales Pipeline). Back in Part 1, I spoke about having a generalized sales funnel. This is where it that helps. Using the different types of insurance example, you may be inclined to create multiple sales funnels/sales pipelines to match each product. However, I’ve found a generalized sales funnel will accommodate all of my products and services better and is less confusing in the long run. That doesn’t mean that you couldn’t/shouldn’t have a specific subprocess (in the form of an activity set) for each prospecting or lead instance however. I have different subprocesses and yesware templates for different products, tactics, targets and contact methods. Each one has it’s own messages. In other words, what I’m saying is when I’m prospecting I don’t just use the 7 x 7 exclusively. I’ve built many different prospecting processes depending upon a variety of factors. All available to be implemented instantaneously by adding a new activity set to a contact. The same is true of every other stage in the process. 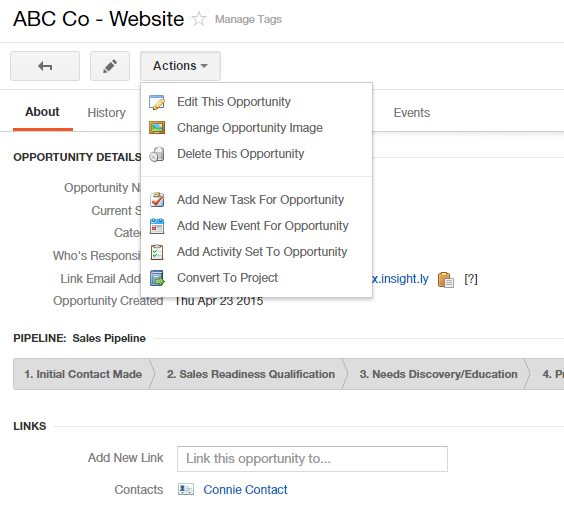 With Insightly you can add an activity set and semi-automate Contacts, Leads, Opportunities, Pipelines, and Projects to create a variety of different, sophisticated business processes. After you select the opportunity pipeline (a.k.a. sales funnel/sales pipeline), then select the stage they are in. In my sales funnel, once I speak with a prospect, I may put them in either initial contact made, sales readiness qualification, or needs discovery/education depending upon what was said in the conversation. If I only speak to them but cannot disqualify them, I place them under initial contact made. If they are qualified and have some interest, but have not asked for specific information, I place them under sales readiness qualification. Finally, if they are qualified but need more information or want to discuss their needs in depth before I present a solution, then I will place them in needs discovery/education. 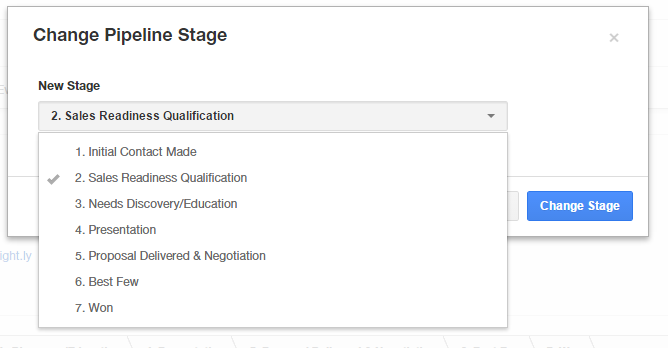 Once you click “Save,” the record will update and give you an overview of the opportunity including the current state, the lead origination category, and a graphical representation of the sales pipeline stages and the current stage the opportunity is in. and on the right-hand side of the page above the pipeline illustration, click the “Change Stage” link. The change pipeline stages panel will open. You can make the change in the drop-down by selecting the stage you want to change it to and then clicking the “Change Stage” button. Insightly will then ask you to name your project. Once you name your project, click the “Convert To Project” button to apply it. You now have the project, which can be found in the “Projects” area. 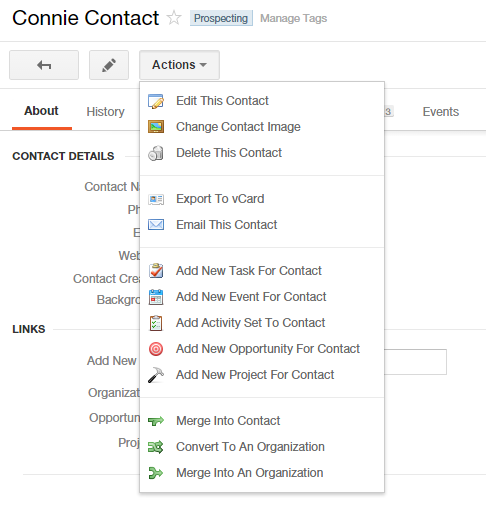 Insightly is a great, easy to use, yet full-featured CRM. There are many pricing options to fit any size business and it gives you the ability to leverage, streamline, and reduce errors in your business processes. There are many features Insightly has that I have not talked about in this article, however, I have given you everything you need to know to successfully begin reaching out and prospecting new and existing contacts and grow your business. At the very least, the section on developing and structuring your sales system should put you head and shoulders above your competition. As I said before, it took 25 years of trial and error to truly learn this information and put it into a simple, easy-to-understand format. I’ve read hundreds of sales and marketing books and none have laid out this information in an easy to understand way like I have in this article. That said, while this information is based upon my experiences, as has everyone who has come before me, I stand on the shoulders of giants. If you have any questions or would like to contact me, please feel free to email me at mmiller@mindwhirl.com. I’m also interested to hear how you apply this information to your business, market, and situation. Michael, this is probably the most detailed review of a product that I have seen till date. Whats awesome is that you don’t do it through the perspective of the product, but from the perspective of what you need to accomplish through the product. This really makes me take a serious look at Insightly. 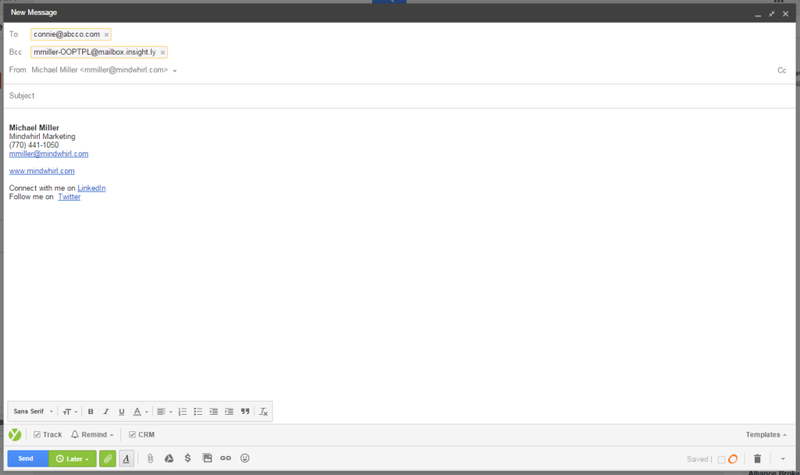 I thought I’ll tell you that we also run a fairly popular product for Google Apps called GrexIt (http://grexit.com) – GrexIt lets you share your Gmail labels, and writes shared notes on emails. Its an awesome way to assign tasks from email, and delegate sales leads and customer support queries to your team. Do check out http://grexit.com, and let me know what you think. I’m on @nirajr on Twitter. Thank you so much for creating and sharing this. As a solopreneur, most of the stuff on CRM’s doesn’t apply to me. I am a business coach and serve network marketers, so having something that works for people like me is so helpful. I am very grateful that you did this and reduced my learning curve by a huge amount!!!! Thanks so much for this! This is the best article I found about Insightly. Do you have a similiar article using LEADS instead of CONTACTS? Michael, Thank you for the excellent article and videos. I’m just starting a tile and carpet cleaning business and am looking forward to implementing Insightly using your guide. Thank you Michael – this is immensely helpful! Quick question: what do you do in your 7×7 method if you qaulify them as an opportunity before the 7th “touch”. As in, if after the first call, the client picks up the phone and is totally interested and there is no longer a need for the other 6 tasks set up by your activity set (assuming you convert the client to an opportunity). Did you find a way for those left over tasks to remove themselves automatically when you made the conversion? Or do you manually delete the extra tasks?